Between 1926 and 1930, further lectures followed in “Gralsblätter” Series II (Booklets 1+2, Booklets 3, 4+5, Booklets 6+7) and in the magazine “Der Ruf” (“The Call”) (Booklet 1+2, Booklet 3+4, Booklet 5, 6,7, Booklet 8+9, Booklet 10, 11, 12, Booklet 13). Until 1 April 1929, the publishing was by Oskar Ernst Bernhardt himself, as the “Gralsblätter Publishing Company”, later transformed into “Der Ruf” Publishing Co. LLC, Munich. While the three booklets of the “Gralsblätter” Series II contained only lectures, Questions and Answers, and advice by Abd-ru-shin, the periodical “Der Ruf”, being a “magazine for all progressive knowledge”, mainly contained articles by authors closely associated with Abd-ru-shin. What should a man do to enter the Kingdom of Heaven? Between 1927 and 1930, Abd-ru-shin published lectures as well as Questions and Answers in the periodical “Der Ruf”. 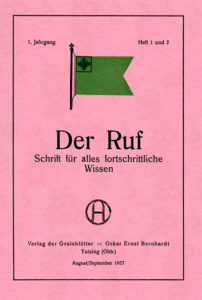 In “Der Ruf“, Booklets 8+9, it was mentioned that Abd-ru-shin had made many contributions to “Der Ruf” and that therefore the next booklet of the “Gralsblätter” Series II would not appear until a few months later. 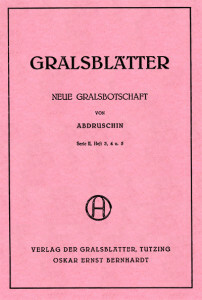 What was thus announced as Booklet 6+7 – the last of Series II of the “Gralsblätter” – was then published only in 1930 and no longer published by the “Gralsblätter Publishers”, but by the publishing company “Der Ruf” LLC., Munich. I am the Lord, thy God! I am the resurrection and the life, no one comes to the Father but by me! What separates so many from the Light today? Does old age constitute an obstacle to spiritual ascent? Thou seest the mote that is in thy brother’s eye, and considerest not the beam that is in thine own eye! In the Grail Message 1931 edition there are to be found 43 lectures out of the 1926 edition and 48 additional lectures, some of which were issued before, and the majority after 1926, in the “Gralsblätter” and the periodical “Der Ruf”, or were released in the 1931 edition for the first time. The lecture “Awaken!” under the title “Live!”, the lecture “Silence” as “The Great Secret” and the lecture “Ascent” as “Redemption” were already published before 1926. In this Edition, the lectures that were published in the “Gralsblätter” Series II and the periodical “Der Ruf” after 1926 (see above), were frequently not incorporated in the order of their first appearance, but rather partly inserted in between other lectures or arranged together in another sequence. The lectures “Watch and Pray!”, “Departed this Life”, “Come down from the Cross!”, “This is my Body! This is my Blood!”, “And a thousand years are as one day!”, “Intuitive Perception”, “The World Teacher” as well as “And thus it was fulfilled …!”, appeared for the first time, in this Edition. If one takes as a basis the sequence of lectures in the edition of 1926, “Watch and Pray!” was inserted in between the lectures “Morality” and “Marriage”. The lecture “Departed this Life” followed on after the lecture entitled “Death”. Originally the lectures “Come down from the Cross!” and “This is my body! This is my blood!” appeared in between the lectures “The crucifixion of the Son of God and the Last Supper” as well as “The resurrection of Christ’s physical body” (both out of “Gralsblätter” Series II, Booklet 1 and 2). The lectures “Occult training, Meat diet or Vegetable diet”, “Healing by Magnetism” and “Is Old Age an Obstacle to Spiritual Ascent?” date back to “Questions and Answers” in the Booklets 3, 4, and 5 of the “Gralsblätter”, Series II. The lecture “The Cross of the Holy Grail”, was not incorporated in this edition. After the “Final Word”, “The Ten Commandments of God” (already published in its own booklet in 1929, along with the lecture “The Lord’s Prayer”) and the lecture “Life” followed as an annex. 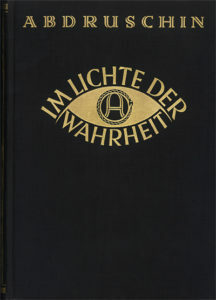 In a departure from the 1926 edition, the large edition contained a whole range of “germanised” concepts. Instead of the word “Clown”, the word “Spaßmacher” was substituted, in place of “Resonanz”, “Widerhall”, and so forth (in the original German edition only). These changes were made arbitrarily, in the course of proofreading by the publishers, in accordance with the spirit of the time. Abd-ru-shin had never agreed to these modifications. Later on, Irmingard Bernhardt, in accordance with the original manuscript, re-inserted in the “Final Authorised Edition” the concepts as they had been used by Abd-ru-shin.